One of the reasons for this trip is to see the Mayan ruins . Next week we will be going to Chichen Itza and Tulum which are the more famous sites and therefore full of tourists. But there are many other sites just as impressive where there are far fewer tourists, and we set off to see some of those today. 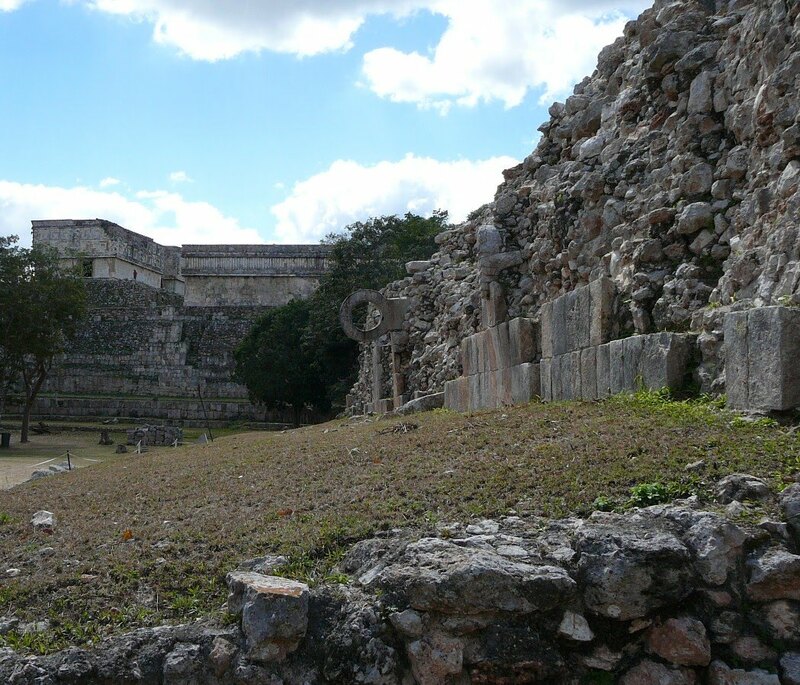 Uxmal is a World Heritage Site where considerable restoration has taken place and is still taking place. It is an hour and a half drive from Merida. The drive is easy, as the Yucatan is almost completely flat and the roads are straight, good and fast. But because the land is flat there is no scenery. 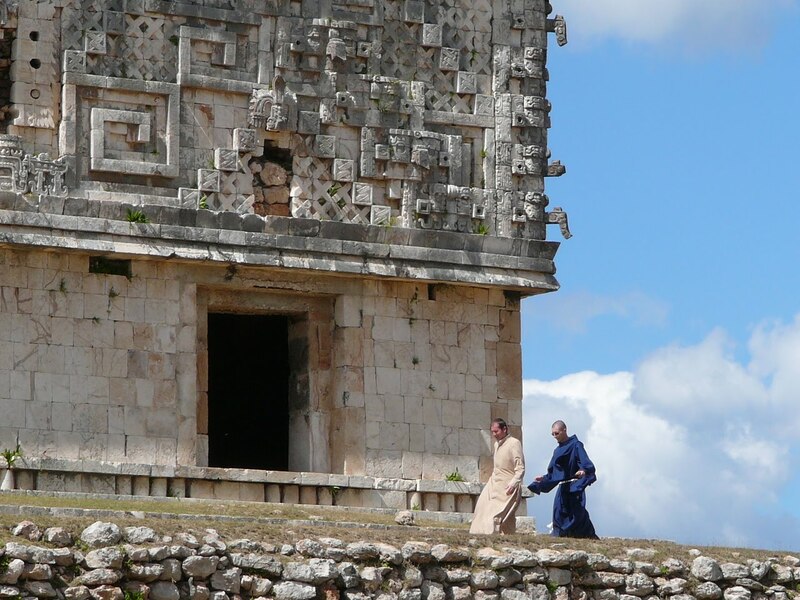 Uxmal and the other sites we are seeing today are built in what is known as the hill country, but the hills are only a hundred or so feet high and hardly cause more than a bump in the road. Uxmal is truly impressive, both in its design and its scale, and even more pleasing is the fact that there are only maybe 25 cars in the car park. In fact the car park is only set up to take about 100 cars. We wander around this wonderful World Heritage Site with just a handful of other tourists. There are four major buildings that have been beautifully restored: including the Governors Palace, the Nun’s Quadrangle and the Magician’s Pyramid. The Magician’s Pyramid is what we all recognize as a Mayan temple. It is similar to an Egyptian Pyramid, but with steps up two sides and a decorated top. It is more faceted than the Egyptian Pyramids . The Mayans were, what could be called, lazy builders. They built their structures using rubble and then clad them with stone, whereas the temples of Angkor Wat were built stone by stone, each one fitting precisely into the next. The exteriors of Angkor Wat are far more elaborate with carvings and statues. The Mayans decorate the top of their buildings but the bottom half often remains plain. The decorations are much more geometric, and indeed a deep understanding of geometry obviously pervades everything the Mayans built. A strong sense of setting dominates Uxmal. There are manicured lawns and trees everywhere. Each building is built on a small plateau affording sweeping views of the land and the other structures. As in all civilizations water was very important. The Yucatan receives very little water, but the Mayans developed a system of collecting the water and storing it underground that is very impressive. Equally as impressive is the games arena that sits in the middle of this Mayan city. A large playing field has a huge sloping stone wall at either side with a hoop half way along built out of it. The hoop is set on its side and is 12 feet or so up the wall. The game was played by two teams of seven, and the object was to get the ball through the opposing teams hoop. The major difference between this and basketball, is that in this game the losing team or team leader is sacrificed. A major incentive, I presume, to play your best game. This entry was posted in Mayan Ruins, Mexico, travel, travel review, travelogue, Uxmal, World Heritage Site, Yucatan. Bookmark the permalink.